One week from today will be a day for all of the crafty lovers nationwide. I am so excited to tell you all about the first National DIY Day. 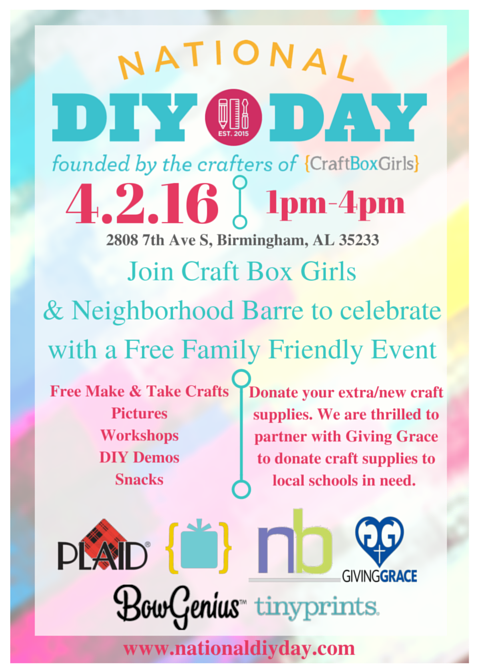 I am partnering with Craft Box Girls to help launch the first DIY Day. There is a national day for everything you can think of from pound cake day to wine day. So, the team at Craft Box Girls decided to day a national day for all of the craft lovers. The mission of National DIY Day is to create a movement that brings people of all ages, races, and demographics together to inspire one another and encourage through hand crafting. Making things and crafting can be so much fun and help you express your style! Happiness is Homemade!! I will be helping host the event here in Birmingham, AL on April 02, 2016 at Neighborhood Barre 1pm-4pm. This family friendly event is free and is for all ages. I hope you join us for this wonderful event!! Happy Crafting!